This is an essential question occasionally asked by patients at Providence Dental. The answer, however, is “No!” Bleeding is probably a sign that you need to clean your teeth and gums more thoroughly – not leave them alone. It is impossible to clean effectively between teeth without using floss or an interdental brush. If you have never flossed before, your gums might bleed the first few times you use floss. The bleeding may be due to detrimental gum inflammation, the beginnings of gum disease. Keep flossing gently and the bleeding ordinarily stops within a week or two. If you don’t make flossing a habit, and your gums become sore, swollen, and tender, it could lead to gum disease. The good news is that, unlike cavities, gum disease can be reversed with improved oral hygiene. Cut a length of floss about 18 inches long. Securely wind each end around your middle fingers. 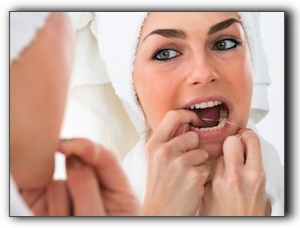 Hold the floss tightly against the side of the tooth and move it up and away from the gumline. You want to clean the space between the tooth and gum without pulling more gum tissue away, so it’s critical to scrape up and out of the pocket. Move the floss around the tooth to clean every surface – especially those that your brush can’t reach. As you use a section of floss, unwind from one hand to access a clean piece. With 18 inches, you should have enough to provide a clean section for every tooth. If you run out, that’s okay. Just toss the used piece and cut a new one. Some people find it easier to start on one end on the upper teeth and clean each gap one by one until they reach the end on the opposite side. Then repeat for the bottom row. Whatever system you elect, make sure you clean around every tooth, including the back surfaces of the last molars. What if you continue flossing for a few weeks and still observe bleeding? Call Providence Dental at 702-852-2244 to schedule a consultation, and we will complete an intensive examination to determine the cause of the bleeding. At Providence Dental, our goal is to help patients preserve healthy teeth and gums. Our dental hygienists not only perform the most thorough dental cleanings, they also educate patients on proper brushing and flossing. If you have a child who needs extra help learning how to brush and floss correctly, schedule an appointment with our Providence Dental child-friendly team. Some patients have perfectly healthy teeth and gums but are not content with their smile due to cosmetic troubles. If you want to explore possibilities for improving your smile, communicate with us today at 702-852-2244. We offer cutting-edge cosmetic dental care including teeth whitening, porcelain veneers, dental crowns, inlays/onlays, and tooth-colored filling replacement. Ask us about oral sedation options if you need help relaxing during dental treatment. You can trust in us to maintain the highest standard of safety and sterility at Providence Dental.